As riders we learn early on about how important our weight distribution is to our horses way of going. We learn about positioning our seat bones, so we can indicate to our horses what exactly the next movement should be. We also learn that our weight aids are fundamental to all aspects of successful communication with our horses in the saddle. What we don't learn is awareness of how the other parts of our body directly or indirectly affect how and where our weight aids are applied with our horse. There is also not a lot of time spent on figuring out how loud or how quiet we can communicate with our horses through our weight aids. In fact, most riders seem to think that a 'one size fits all' approach is sufficient regardless of the circumstances, situation or horse involved. Learning to correctly feel and then master your weight aids in the saddle is key to developing good feel as a rider. Those subtle shifts and movements, which happen when you direct your muscles to move, rather than your actual weight or bones themselves. This is very much apparent when turning your horse and that is what I want to focus on today. So let's begin with focusing on how your carry yourself in the saddle. Many riders make the mistake of going a little too overboard when told to 'relax' through their body. Ideally you want your muscles to 'carry' you in the saddle, enough that your hips and seat are free to move with your horse and follow the motion. Following when riding is a little like following when dancing. The dancer that is following must remain in control of their body, walking that fine line between too relaxed or 'slack' and too tense or 'rigid'. All the while they are looking for cues from their partner and then taking the responsibility on themselves to respond to those cues in the agreed manner. Riding in the same. Following does not mean you slouch in the saddle, looking like you have had one too many before you mounted. It rather means you carry your upper body, so your hips and seat are then willing and able to follow the horse's motion as he crosses the ground. Think about it, your hips and seat bones can not possibly be free to perform a full range of motions if your upper body is heavy and slouching on top of it. Many riders mistake this for 'shoulders back', which is unfortunate as this only serves to increase the excess tension and therefore rigidness in the body, rather than simply carrying yourself, through your ribcage and positioning your body in the best possible place from which to begin asking your horse to turn using your weight aids. Once you are sure that you are indeed carrying yourself and, as a result, correctly following your horse wiht your seat, you can then begin looking at how subtle changes in different areas of your body will affect your weight aids and therefore what you communicate to your horse through your seat. So to begin with, let's focus on the half halt. One of the reasons we apply the half halt is to bring your horse's attention back to you and let him know something is coming up. Not using your half halt will probably result in your horse's attention being elsewhere and therefore, any subtle movements with your seat to communicate with your horse will have a good chance of being ignored. That being said, it is also worth noting that applying the half halt and then following it up with an incorrect, overly exaggerated or heavy use of the seat and weight aids is just as ineffective as not using the half halt at all. Think of your half halt as the opening part of the sentence which will then, in turn, lead up to the actual question you wish to ask your horse. Become clear on what you want to ask, before you draw your horse's attention to your seat to begin with! Once you have his attention, think about what you want of your horse as he rounds the bend. 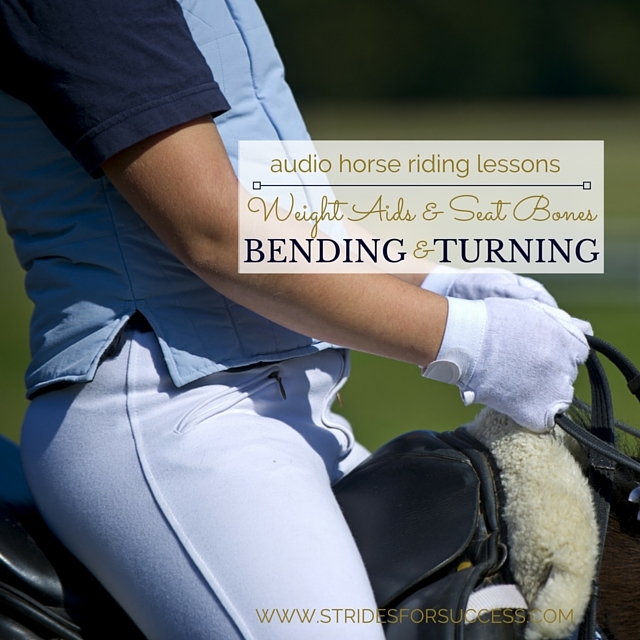 Ideally, your horse's spine should replicate the arc of the bend or circle. Your horse's spine will stay on the arc all the way through, from his poll or ears to his tail or dock. Similarly, your spine will too stay centered over your horses, not leaning one way or the other, not twisting and not collapsing to either the inside or outside. His hips will travel along parallel either side along this arc, however his inside hip will come slightly forward or ahead of his outside hip. Your hips or seat bones will be in this same position. Then look at the shoulders; again, they should remain parallel to the central arc or track as he moves along (like train tracks), however the outside shoulder will have to move a little more forward in order to do so and, therefore, so must your shoulders. It seems like an awful lot to remember, and when starting out, it is! I have found it easier for some riders to rather remember where their legs should be through the turn. Because your legs are connected to your hips, by moving them into the desired position, your seat bones will generally follow suit and automatically also 'slot' into position. However, as you become used to the inside and outside being dictated by your horse, regardless of where you are in the arena, you can begin rather making the subtle shifts with your seat bones, and then allowing your legs to follow suit. So back to how we can use our muscles, either for good or bad, to influence our weight in the saddle. Find a hard chair or stool and sit down with a hand under each of your seat bones. Now, begin by moving your shoulders, the right one forwards the left one back and then vice versa. Notice how a very small movement of only an inch or so, will change how the pressure being exerted on your hands from your seat bones feels. Similarly, think about 'weighting' one of your seat bones. Many riders will literally 'bear down' on that particular seat bone, shifting their upper body to do so. However, feel that when this happens, your seat bones actually begin 'sliding' towards the opposite side. Now, rather think of 'weighting' that seat body through a combination of elongating the muscles on that side of your torso, and sending a tiny bit more weight or pressure to the heel of that leg. Notice the subtle change in the pressure being applied on your hand. It only takes small but precise adjustments with your muscles to 'weight' the seat bone. The more you can learn to control your muscles, the clearer your communication will become with your horse. The result is that your horse will move completely differently to how you had planned, because he is trying to remain balanced and, literally, stay underneath you. If you find this happening a lot, go back to making sure you are symmetrical, balanced and straight in the saddle and, once you are sure of that , begin insisting on it from your horse also. Always think about your own body and what you are communicating with your horse while riding through the corner. I really think that being a little 'picky' or obsessive about riding in the correct position will help you to make sure that your body is in the best possible place to apply the correct aids for any given movement or direction. It will take concentration and consistent effort on your part initially, but as your 'feel' increases, you will find that merely thinking about it will result in your body shifting slightly in the saddle - and the more consistent you are with always riding in the correct way, the more effective your horse will be at reading the small, subtle changes in your weight and position.